These trees have been pre-trained at our nursery so that you can get an immediate effect in your garden. Click here for availability of 2-year espalier-trained apple and pear trees. Click here for availability of 2-year fan-trained fruit trees. Unfortunately these 2-year trained trees can only be delivered to certain parts of mainland of England, Wales and southern Scotland. You are welcome to contact us by phone or email to discuss your requirements before ordering. These trees are usually supplied on a small pallet and you must arrange to have someone present to receive the delivery. A further option is that you can train your own trees from first principles. This gives you the maximum flexibility in terms of choice of variety and rootstock, but will take a bit longer to achieve results. It is definitely the best solution if you have slightly unusual requirements, such as needing branches at specific heights or wanting to train the tree in a specific shape or a specific rootstock. The starting point is a 1-year bare-root tree on a suitable rootstock, which is then cut back to begin the fan or espalier training process. We can advise on the best choice of variety and rootstock depending on what you want to achieve. More details about how to train your own fruit trees. We also recommend the RHS Pruning and Training book by Brickell and Joyce, which gives detailed instructions on fan and espalier training. IMPORTANT: When choosing a rootstock for your trained tree, you will nearly always need a more vigorous rootstock than you might think. This is because, as a result of the espalier / fan training process, a trained tree will not reach the same mature height as a free-standing tree would. For most trained fruit tree projects where you have a typical 6ft / 2m fence you will probably need to use a semi-vigorous rootstock - MM106 for apples, St. Julien for plums, Colt for cherries, and Quince A for pears. You are welcome to contact us if you need further advice. A typical fan-trained fruit tree on a semi-vigorous rootstock will need a width of 3m - 4m / 10ft - 14ft and a height of 2m - 3.5m / 6ft - 12ft. The dimensions will vary dependent on the vigour of the particular variety you are planting. Plums and cherries will be at the upper end of this scale, while less vigorous apple varieties might be at the lower end of this scale. Espalier-trained trees on semi-vigorous rootstocks will need a width of roughly 3m - 3.5m / 10ft - 12ft and a height of 1.75m - 2m / 5ft - 7ft per tree, but these dimensions are only approximate and actual height and spread could vary considerably depending on your local conditions and how you prune the tree. Remember that the mature size of the tree will be greatly affected by the planting situation, and local soil and climate. Trees on north-facing walls will not get as big as those on south-facing walls. You also have some control of the height vs width, in that you can train the tree as it grows to fit the dimensions you have available. Individual espaliers tend to look more pleasing if the width is greater than the height, whereas fans will work with various proportions of width and height. Our espalier-trained trees have arms at approximately 15"-18" and 30"-32" with potential for a third tier at about 45" or so. We recommend that you do not put your wire supports in place until you have planted the trees, so that you can match the positions to the tiers. However if the wires are already in place it is usually quite easy to bend the branches up or down a bit to fit. Our fan-trained trees are usually supplied with the central leader still intact where possible, as this allows you to choose whether to continue the tree as a 'Y' fan or a palmette fan. In the former case you can remove the central leader altogether, leaving just the lowest tier of branches. In the latter case we recommend you cut the leader back to a point where you have sufficient branches for the fan - but do make sure you cut it back rather than leaving it in place. If training your own then you have much more flexibility to set the heights to meet your requirements, and you can use different rootstocks to achieve different overall dimensions. In general when growing trained fruit trees it is better to err on the side of more vigorous rootstocks. We are often asked if it is possible to grow a "high" espalier, with the first tier of branches starting higher up the stem, e.g. 1m to clear a low wall or 2m to create a dramatic effect. The answer is yes, but these have to be trained from first principles, starting with a 1 year tree. Usually a more vigorous rootstock will be required to help get the required height. 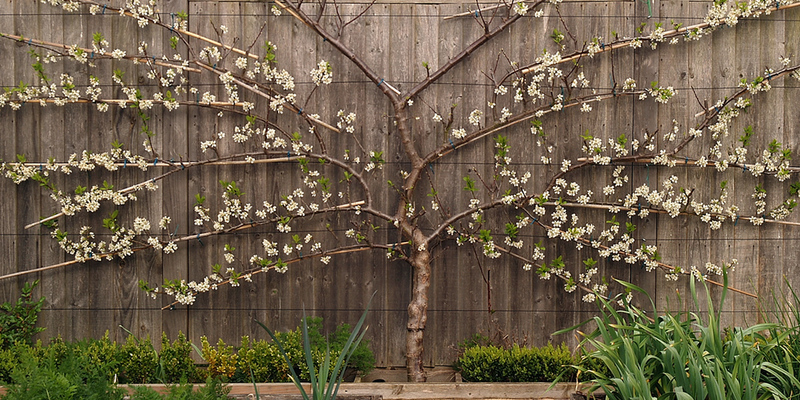 If you want a very formal effect then choose espalier-trained trees, as the 90-degree angles between the stem and the branches create an attractive regimented appearance, compared with the more variable angles of fan-trained trees. Conversely for a flowing semi-formal effect, choose a fan-trained tree. (Fan-trained trees are also a bit easier to maintain, and a bit more forgiving of pruning errors). Whilst a single trained tree will look impressive, a more dramatic effect is achieved if you plant several (3 or more) together. When planting several trained trees together, you will get a more regular effect if you choose trees of the same variety - although of course this means you will have a glut of fruit all at once. If you prefer to have a bit more choice, you can still get a nice formal effect by alternating two or three varieties in a row of four or six trees. This means you will have more choice of fruit through the season, and probably better pollination in the spring. Similarly, it is often best to choose varieties of the same species - in other words plant all pears, or all apples, or all plums. This will give you a much more consistent effect than if you mix and match species. There is quite a noticeable difference in the way that plums / cherries / peaches / apricots grow, compared with apples / pears, so a trained apple tree beside a trained plum tree might look a bit odd. Remember that whilst apples and pears can be trained as either fans or espaliers, stone fruits can only be trained as fans. Here is a mature fan-trained plum tree with the central leader retained. Note how it has has been bent in a zig-zag pattern to encourage the tree to direct growth into the arms of the fan. Photo courtesy of Keir Watson - see his blog for more examples of trained fruit trees, including photos of trained fruit trees at West Dean Gardens.